Céramique™ 2 Tri-Linear Ceramic Thermal Compound The high-density, ceramic-based thermal compound specifically designed for modern high-power CPUs and high-performance heatsinks or water-cooling solutions. 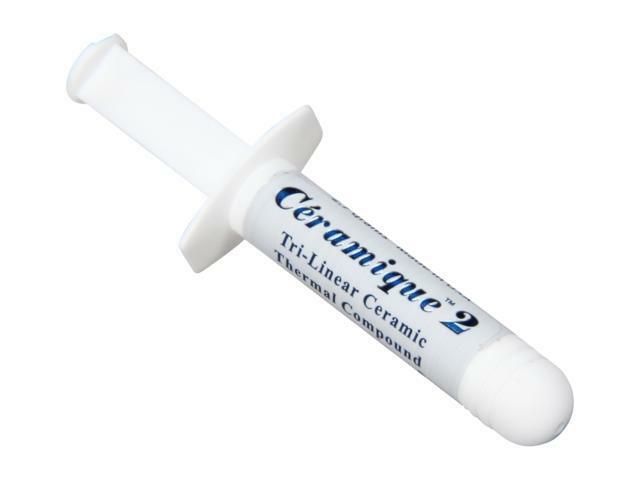 Features: Tri-Linear Ceramic Content: Like the original Céramique, Céramique 2 uses only ceramic fillers so it is neither electrically conductive nor capacitive. The tri-linear composite of aluminum oxide, zinc oxide and boron nitride allows the thinnest possible bond line with modern processors, heatsinks and electronics. Critically-sized particles and new ultra-high shear mixing techniques maximize Céramique 2's thermal performance and help maintain a stable homogenous suspension. This exclusive combination provides performance exceeding most metal based compounds. Polysynthetic Suspension Fluid: A new oil mixture, improved thermal filler properties and increased particle deagglomeration, dispersal and density enhance Céramique 2's thermal performance and overall stability. The third generation polysynthetic suspension fluid combines advanced synthetic oils to maximize wetting and stability while allowing a higher density of thermally conductive fillers. Excellent Stability: Céramique 2 is engineered to not separate, run, migrate, or bleed. Electrical Insulator: Céramique 2 does not contain any metal or other electrically conductive materials. It is a pure electrical insulator, neither electrically conductive nor capacitive. Performance: 2 to 10 degrees centigrade lower CPU full load core temperatures than standard thermal compounds or thermal pads when measured with a calibrated thermal diode imbedded in the CPU core. Innovative Dispenser: The amount of compound remaining in the 2.7-gram syringe is easy to determine as the rear of the plunger is perfectly flush with the flange when the syringe is empty. Easy Clean Up: Céramique 2 can easily be cleaned from CPUs and heatsinks with ArctiClean, isopropyl alcohol or any of the cleaners listed in the product instructions. Compliancy: RoHS Compliant. At a layer 0.003" thick, one syringe will cover about 22 square inches. At a layer 0.003" thick, one syringe will cover about 200 square inches. Like the original Ceramique, Ceramique 2 uses only ceramic fillers so it is neither electrically conductive nor capacitive. The tri-linear composite of aluminum oxide, zinc oxide and boron nitride allows the thinnest possible bond line with modern processors, heatsinks and electronics. Critically-sized particles and new ultra-high shear mixing techniques maximize Ceramique 2's thermal performance and help maintain a stable homogenous suspension. This exclusive combination provides performance exceeding most metal based compounds. A new oil mixture, improved thermal filler properties and increased particle deagglomeration, dispersal and density enhance Ceramique 2's thermal performance and overall stability. The third generation polysynthetic suspension fluid combines advanced synthetic oils to maximize wetting and stability while allowing a higher density of thermally conductive fillers. Ceramique 2 is engineered to not separate, run, migrate, or bleed. Ceramique 2 does not contain any metal or other electrically conductive materials. It is a pure electrical insulator, neither electrically conductive nor capacitive. Ceramique 2 can easily be cleaned from CPUs and heatsinks with ArctiClean, isopropyl alcohol or any of the cleaners listed in the product instructions. Cons: Well, there are other, higher-performing thermal pastes out there, but, they tend to be either Conductive, Capacitive, or, Expensive. Other Thoughts: I am about to purchase my second tube of this paste. Let me tell you, I have been more than happy with the performance that the Ceramique provides for most situations. I mostly air cool my CPUs, and this compound works wonders, often dropping 3 degrees C or more off of whatever toothpaste that manufacturers supply with their heatsinks. Also, crucially, this is a totally non-conductive and non-capacitive compound. So, there is zero threat of shorting or of damaging your expensive hardware. Moreover, it has a very reasonable price, even less than the vaunted Arctic Silver V, which, BTW, is capacitive. Look, at a certain point, you may need to graduate to a higher-performing thermal paste. But, anything short of exotic cooling or extreme overclocking will benefit from using this thermal paste. Plus, you can't go wrong at this price. Pros: Works great. Its more of a thermal paste for people like me who switch out cpus/gpus/coolers all the time. Its short term use is great. I have no idea how it holds up in the long run because the most its ever stayed on one of my cpus is no more than a year cause reasons. Cons: Dont know how well it holds up for any length of time. Other Thoughts: I use Artic SIlver 5 or Artic MX-2/MX-4 for long term stability. Pros: High quality thermal paste. Spreads out nicely and if you have to remove the cooling fan later on, it won't harden on you and cause any damage to the CPU while trying to remove the heatsink. Pros: - It cooled my CPU from a dangerous 210°F to 170°F at a heavy work load. - Perfect solution for anyone who needs a quick easy cool down. Cons: - Very very small... Looking at the picture I kinda thought it would be bigger and I could keep it forever but if you're using a pea sized squeeze on the processor you might get 2 peas out of this. Pros: Worked well on a Ryzene 5 2400G with stock fan. Other Thoughts: Applied this to two new builds and it has done a great job cooling. Pros: Easy to lose and/or throw away after realizing it is not needed. Cons: This was marketed as a "must purchase with" item with a processor and/or heat sink (cpu cooler). CPU coolers come with this in the package. Save your money. 0 out of 27 people found this review helpful. Did you?